A tree risk rating system is essential to ensure that appropriate and reasonably consistent criteria are used to evaluate the relative hazard of a tree. Utilization of a rating system allows for the systematic prioritization of hazard tree removal and enables the development of realistic fiscal budgets needed for their removal. The recently introduced manual, Urban Tree Risk Management: A Community Guide to Program Development and Implementation, has been developed by the USDA Forest Service, in cooperation with several agencies, states and commercial arborists. Included in the guide is a system which is used to calculate a relative risk rating for the surveyed tree. Until recently, this data collection and rating calculation has been done via paper and tally sheet. Now, the data collection system has been automated through the development of a Pocket PC software program, and a related desktop component. 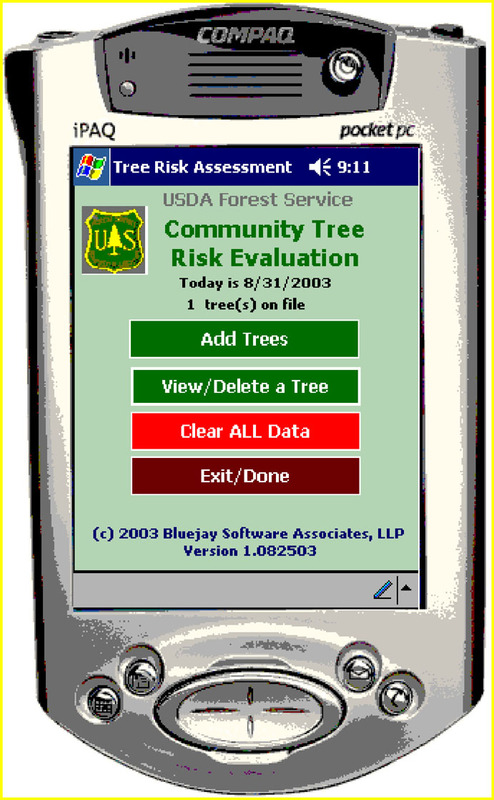 The BETA version of the software, developed at the Forest Service's Northeast Center for Urban & Community Forestry, is designed for use on a Pocket PC handheld PDA. Using the software, the user can seamlessly collect data in the field and download it to a database on a personal computer. The software is currently under BETA development. The latest version of the software can be downloaded and tested at the links found below.